Hawaiian islands undergo a systematic pattern of submarine and subaerial growth that is followed by erosion. An island's stage of development reflects its distance from the Hawaii hotspot. Kauaʻi, anglicized as Kauai, is geologically the oldest of the main Hawaiian Islands. With an area of 562.3 square miles (1,456.4 km2), it is the fourth-largest of these islands and the 21st largest island in the United States. Known also as the "Garden Isle", Kauaʻi lies 105 miles (169 km) across the Kauaʻi Channel, northwest of Oʻahu. This island is the site of Waimea Canyon State Park. Alkali basalt or alkali olivine basalt is a fine-grained, dark-coloured, volcanic rock characterized by phenocrysts of olivine, titanium-rich augite, plagioclase feldspar and iron oxides. For similar SiO2 concentrations, alkali basalts have a higher content of the alkalis, Na2O and K2O, than other basalt types such as tholeiites. They are also characterized by the development of modal nepheline in their groundmass (visible at highest magnification on a petrographic microscope) and normative nepheline in their CIPW norms. Alkali basalts are typically found on updomed and rifted continental crust, and on oceanic islands such as Hawaii, Madeira and Ascension Island. Maui Nui or Greater Maui, is a modern geologists' name given to a prehistoric Hawaiian Island built from seven shield volcanoes. Nui means "great/large" in the Hawaiian language. A photo of pillow lava, the typical type of flow from submarine volcanoes. 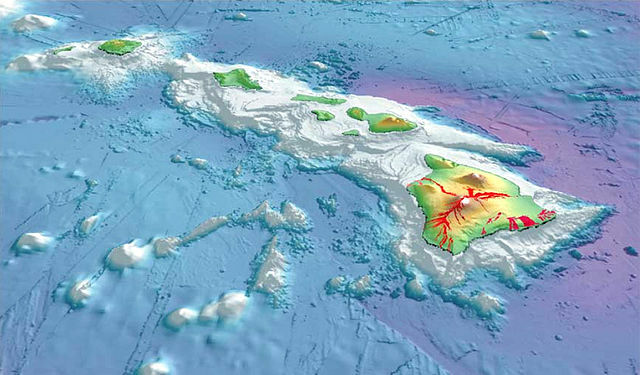 Bathymetric rendering of Lōʻihi, the only known Hawaiian volcano that is currently still in the Pre-Shield stage. Because the eruptions occur with the volcano underwater, the form of lava typically erupted is pillow lava. Pillow lava is rounded balls of lava that was given very little time to cool due to immediate exposure to water. Water pressure prevents the lava from exploding upon contact with the cold ocean water, forcing it to simmer and solidify quickly. This stage is thought to last about 200,000 years, but lavas erupted during this stage make up only a tiny fraction of the final volume of the volcano. As time progresses, eruptions become stronger and more frequent. The only example of a volcano in this stage is Loihi Seamount, which is now transitioning into this phase from the preshield stage. Lava bubbles explosively as it hits the cold water. Mauna Loa and Kīlauea volcanoes are in this phase of activity. The dark outline of Hualālai, showing the worn and weathered shape of a volcano in the Post-shield stage. Mauna Kea, Hualālai, and Haleakalā volcanoes are in this stage of activity. 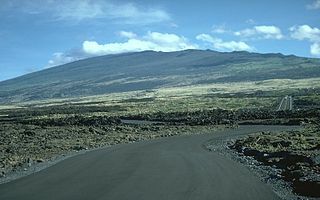 Kohala, Mahukona, Lanai, and Waianae volcanoes are examples of volcanoes in this stage of development. Koolau Range, West Maui, and Kahoolawe volcanoes are examples of volcanoes in this stage of development. Note, however, that because in this stage eruptions are very infrequent (occurring thousands or even tens of thousands of years apart), erosion is still the primary factor controlling the volcano's development. After the rejuvenated stage, the volcano is too far away from the hotspot to receive new magma, and therefore will never erupt again. The volcano continues to sink into the ocean, and become deeply eroded, leading to infrequent, but large collapses in its original structure. The volcano has no remaining magma in its chambers, and is truly dead. West Molokai, Waialeale, and Niihau volcanoes are in this stage of development. An animated sequence showing the erosion and subsidence of a volcano, and the formation of a coral reef around it – eventually resulting in an atoll. Eventually, erosion and subsidence break the volcano down to sea level. At this point, the volcano becomes an atoll, with a ring of coral and sand islands surrounding a lagoon. All the Hawaiian islands west of the Gardner Pinnacles in the Northwestern Hawaiian Islands are in this stage. Atolls are the product of the growth of tropical marine organisms, so these islands are only found in warm tropical waters. Eventually, the Pacific Plate carries the volcanic atoll into waters too cold for these marine organisms to maintain a reef by growth. Volcanic islands located beyond the warm water temperature requirements of reef building organisms become seamounts as they subside and are eroded away at the surface. An island that is located where the ocean water temperatures are just sufficiently warm for upward reef growth to keep pace with the rate of subsidence is said to be at the Darwin Point. Islands in more northerly latitudes evolve towards seamounts or guyots; islands closer to the equator evolve towards atolls (see Kure Atoll). Hualālai is an active volcano on the island of Hawaiʻi in the Hawaiian Islands. 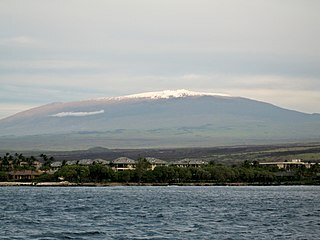 It is the westernmost, third-youngest and the third-most active of the five volcanoes that form the island of Hawaiʻi, following Kīlauea and the much larger Mauna Loa. Its peak stands 8,271 feet (2,521 m) above sea level. Hualālai is estimated to have risen above sea level about 300,000 years ago. Despite maintaining a very low level of activity since its last eruption in 1801, and being unusually inactive for the last 2,000 years, Hualālai is still considered active, and is expected to erupt again some time within the next century. The relative unpreparedness of the residents in the area caused by the lull in activity would worsen the consequences of such an event. Tweed Volcano is a partially eroded Early Miocene shield volcano located in northeastern New South Wales, which formed when this region of Australia passed over the East Australia hotspot around 23 million years ago. Mount Warning, Lamington Plateau and the Border Ranges between New South Wales and Queensland are among the remnants of this volcano that was originally over 100 kilometres (62 mi) in diameter and nearly twice the height of Mount Warning today, at 1,156 metres (3,793 ft). Despite its size, Tweed Volcano was not a supervolcano; other shield volcanoes - such as on Hawaii - are much larger. In the 23 million years since the volcano was active, erosion has been extensive, forming a large erosion caldera around the volcanic plug of Mount Warning. Its erosion caldera is the largest in the Southern Hemisphere. The East Australia hotspot is a volcanic hotspot that forces magma up at weak spots in the Indo-Australian Plate to form volcanoes in Eastern Australia. It does not produce a single chain of volcanoes like the Hawaiian Islands. Unlike most hotspots, the East Australia hotspot has explosive eruptions, as well as the runny lava flows of the Hawaii hotspot, the Iceland hotspot and the Réunion hotspot. The hotspot is explosive because basaltic magma interacts with groundwater in aquifers below the surface producing violent phreatomagmatic eruptions. The geology of the Pacific Northwest includes the composition, structure, physical properties and the processes that shape the Pacific Northwest region of the United States and Canada. The geology of the region is responsible for some of area's scenic beauty as well as some of its hazards, such as volcanoes, earthquakes, and landslides. The Cobb-Eickelberg seamount chain is a range of undersea mountains formed by volcanic activity of the Cobb hotspot located in the Pacific Ocean. The seamount chain extends to the southeast on the Pacific Plate, beginning at the Aleutian Trench and terminating at Axial Seamount, located on the Juan de Fuca Ridge.The seamount chain is spread over a vast length of approximately 1200 km. The location of the Cobb hotspot that gives rise to these seamounts is 46° N -130° W. The Pacific plate is moving to the northwest over the hotspot, causing the seamounts in the chain to decrease in age to the southeast. Axial is the youngest seamount and is located approximately 480 km west of Cannon Beach, Oregon. The most studied seamounts that make up this chain are Axial, Brown Bear, Cobb, and Patton seamounts. There are many other seamounts in this chain which have not been explored. 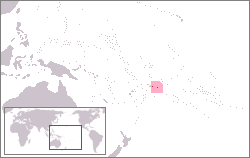 The Samoa hotspot is a volcanic hotspot located in the south Pacific Ocean. The hotspot model describes a hot upwelling plume of magma through the Earth's crust as an explanation of how volcanic islands are formed. The hotspot idea came from J. Tuzo Wilson in 1963 based on the Hawaii volcanic island chain. The volcanology of Eastern Canada includes the hundreds of volcanic areas and extensive lava formations in Eastern Canada. The region's different volcano and lava types originate from different tectonic settings and types of volcanic eruptions, ranging from passive lava eruptions to violent explosive eruptions. Eastern Canada has very large volumes of magmatic rock called large igneous provinces. They are represented by deep-level plumbing systems consisting of giant dike swarms, sill provinces and layered intrusions. The most capable large igneous provinces in Eastern Canada are Archean age greenstone belts containing a rare volcanic rock called komatiite. 1 2 3 4 5 6 7 8 9 10 11 12 13 14 15 16 17 "Evolution of Hawaiian Volcanoes". USGS Site. USGS. September 8, 1995. Retrieved 2018-05-29. 1 2 3 L. Hamilton, Rosanna (1995). "Introduction to Hawaiian Volcanoes". Web. www.solarviews.com. Retrieved 2009-03-09. 1 2 3 4 5 6 7 8 9 10 Morgan, Joseph R. (1996). 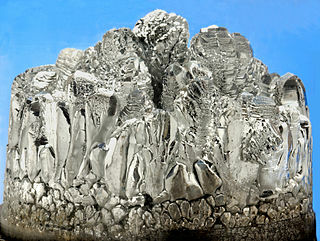 "Volcanic Landforms". 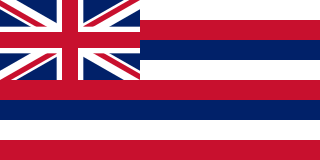 Hawaiʻi: A Unique Geography. Honolulu, HI: Bess Press. pp. 9–13. ISBN 1-57306-021-6. ↑ "Hawaii's Volcanoes Revealed" (PDF). USGS Poster. USGS. Archived from the original (PDF) on 2004-10-26. Retrieved 2009-03-28. ↑ Rhodes, J. Michael; Garcia, Michael O.; Norman, Marc. "Geochemical Arguments Favoring a Hawaiian Plume". PowerPoint Presentation. University of Massachusetts, University of British Columbia, University of Hawaii, Australian National University. Retrieved 2009-03-08. ↑ Garcia, Michael O.; Caplan-Auerbanch, Jackie; De Carlo, Eric H.; Kurz, M.D. ; Becker, N. (2005-09-20). "Geology, geochemistry and earthquake history of Lōihi Seamount, Hawaii" (PDF). This is the author's personal version of a paper that was published on 2006-05-16 as "Geochemistry, and Earthquake History of Lōʻihi Seamount, Hawaii's youngest volcano", in Chemie der Erde – Geochemistry (66) 2:81–108. SOEST . Retrieved 2016-01-14. ↑ Konter, Jasper G.; Staudigel, Hubert; Gee, Jeffry. "Spotlight 2: Jasper Seamount" (PDF). Oceanography . Seamounts Special Issue. Oceanography Society. 23 (1). Archived from the original (PDF) on 13 June 2010. Retrieved 28 July 2010. Robert W. Decker; Thomas L. Wright; Peter H. Straffer (eds.). Volcanism in Hawaii-Volume 1 (PDF). United States Geological Survey-Volcanism of Hawaii. volume 1. USGS (Paper number 1350) and the Hawaii Volcanism Observatory. Retrieved 2009-03-31.